The duo star alongside Rachel Weisz in the black comedy about the court of Queen Anne, with the Broadchurch actress playing the monarch and Weisz and Stone playing courtiers tussling for her favour. Colman is hotly tipped to pick up an Oscar nomination for the role, while Stone and Weisz could both feature in the supporting category and will already compete against each other at the Golden Globes. Stone told the Press Association: “She might be a national treasure (in the UK) but she is also a personal treasure, that woman is on another level of human being, we all agree. 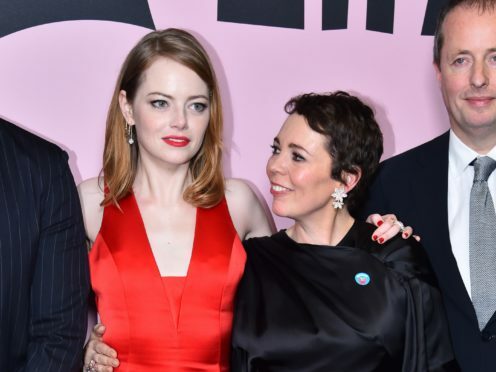 Stone, who won the best actress Oscar in 2017 for her part in La La Land, said she is not paying too much attention to the speculation about the film’s awards chances. She said: “I love this film so much that I feel so lucky to be a part of it that that is what I focus on and what I focused on before. Stone added it continues to be unusual for films to feature three such substantial role for women saying: “It felt like a real diamond, it was very exciting to see three incredibly complex, flawed, funny women in one film and I thought they were all so beautifully written. “So I would hope that the tide has shifted a bit but I know that Yorgos (Lanthimos, the director) was also working on this movie for nine years so it wasn’t like this was coming out of a brand new time, it’s been the last decade. “What is amazing about this story is it begins with a woman in power, I like that it is not a story about having to overthrow a man for power and it doesn’t really have anything to do with the men because there is no argument there, there is no fight there.